I feel like I’m in a “if you give a mouse a cookie” situation. I wanted to test the goat cheese ice cream recipe before posting, doubled, so had to use a dozen egg yolks. I am not one to enjoy egg white omelets — let’s be honest, I’m really here for the yolk — so I had to think of something to do with all those whites. That’s where David Lebovitz’s recipes come to the rescue again! He has a whole list of what to do with leftover egg whites. I still have a ton left over, but a double batch of these macaroons certainly put a dent in it. After this, I swear we’ll be back to the regularly-scheduled programming with tasty, nutritious meals. 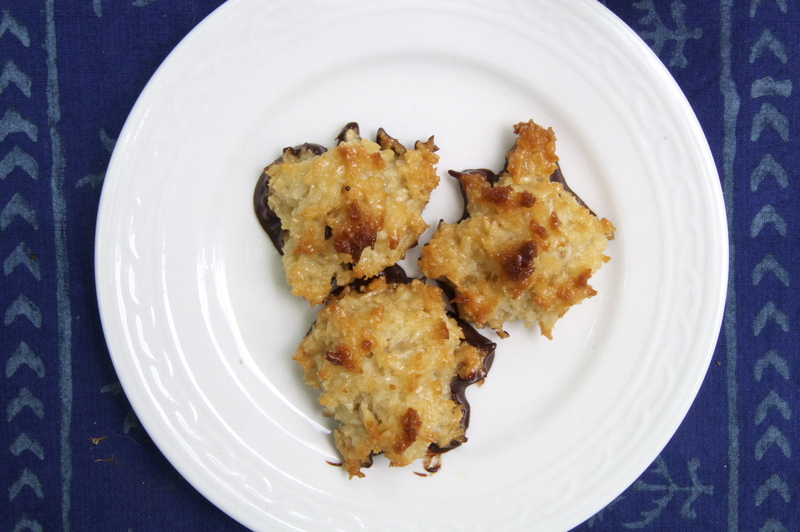 But chocolate-dipped coconut macaroons? I can’t really resist. Further down the line, I’ll try one of the many gluten-free macaroon recipes out there. A lovely tip he gives in his leftover egg white post is that one egg white is typically 2 tablespoons. So, this recipe would use 8 tablespoons of egg whites. Super helpful, although I could not seem to measure the slippery whites in tablespoons for the life of me. You’d need 1/4 cup of egg whites to make one batch. In a large skillet, combine the egg whites, sugar, salt, honey, coconut and flour, mixing well. Heat on the stovetop over low-to-medium heat, stirring constantly, scraping the bottom as you stir to prevent bits from sticking. As soon as you begin to get toasty bits on the bottom, remove the skillet from heat and add in the vanilla. Transfer the dough to a bowl and let cool to room temperature – you can just put it in the fridge for a few minutes if you need to. You may also keep the dough in the fridge for up to a week, or freeze for up to two months. Scoop little 1 1/2-inch mounds with your hands, evenly spacing them out on the baking sheet. It helps to have a glass of water nearby to dip your hands in every so often, otherwise it’ll get a bit sticky. Bake for 18-20 minutes, until they’re a beautiful deep brown. Cool fully, before dipping in the chocolate. Once the cookies are completely cooled, melt the chocolate in a clean, dry bowl (I typically use glass and a heat-proof spatula to stir) set over a pan of simmering water. If you’re baking the same day, hold onto the parchment paper you baked them on, to set the chocolate dipped cookies back on. Dip the bottoms of each cookie in the chocolate and set the cookies on the baking sheet. Refrigerate 5-10 minutes, until the chocolate is set. YUM!